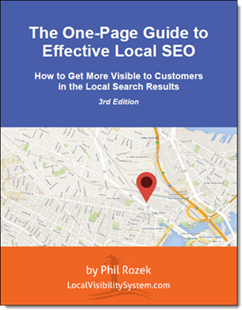 Why Does Your Business Deserve Success in Local Search? What’s really different about how you’ve represented your business online? Do you have better reviews, more reviews, and reviews on more sites than your competitors do? Have you done anything to earn a mention or write-up in the local newspaper – and can you do something like it again? Do you describe each of your services on a separate page and in so much detail that your potential customers might (temporarily) think they don’t even need you? Do you produce videos that are informative enough you’d send them to relatives who want to know exactly what it is you do for a living? Do you practice any other forms of RCS? Give people a reason to click, pay attention, and get in touch. Give Google at least one concrete reason to rank your business well. Worry about them in that order. You might say, “But my competitors don’t stand out in any way.” Well, they may do the boring stuff better than you do. There’s also nothing to say that their rankings will last, or that they get many customers out of the deal. Above all, it doesn’t matter much what your competitors do or don’t do if your goal is to outrank them. Start working on at least one of those standout factors at the same time you work on (or ask for help with) the rest of your local SEO. You’re more likely to get visible, and for that visibility actually to bring phone calls. Man, you hit the nail on the head. Unfortunately it seems that a lot of business owners would prefer not to be bothered with the ‘online stuff’, but you make great points. Are they providing value? Are they differentiating themselves? etc. Good post Phil. Thanks, Tyson. Yeah, saying “offer value” is a bit of an eat-your-spinach proposition. But I also think too many business owners make way too big a deal out of it – putting off the production so that it becomes more and more daunting. That first post or video or page or whatever is the hardest by far.